Trigger point therapy is one of the fastest-growing and most effective pain therapies in the world. Medical doctors, chiropractors, physical therapists, and massage therapists are all beginning to use this technique to relieve patients' formerly undiagnosable muscle and joint pain, both conditions that studies have shown to be the cause of nearly 25 percent of all doctor visits. This book addresses the problem of myofascial trigger points-tiny contraction knots that develop in a muscle when it is injured or overworked. Restricted circulation and lack of oxygen in these points cause referred pain. Massage of the trigger is the safest, most natural, and most effective form of pain therapy. Trigger points create pain throughout the body in predictable patterns characteristic to each muscle, producing discomfort ranging from mild to severe. Trigger point massage increases circulation and oxygenation in the area and often produces instant relief. 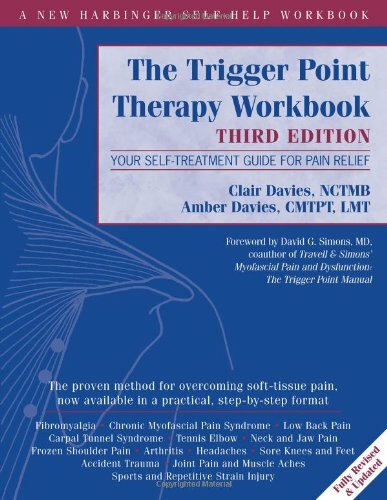 The Trigger Point Therapy Workbook, Third Edition, has made a huge impact among health professionals and the public alike, becoming an overnight classic in the field of pain relief. This edition includes a new chapter by the now deceased author, Clair Davies' daughter, Amber Davies, who is passionate about continuing her father's legacy. The new edition also includes postural assessments and muscle tests, an illustrated index of symptoms, and clinical technique drawings and descriptions to assist both practitioners and regular readers in assessing and treating trigger points.